We all know people with “external morality,” or “situational morality.” These are people who make behavioral decisions based on who is around at the time and what the personal consequences will be. Many of these people actually believe that there is no moral standard; there is only what works for me personally in the moment. “As long as no consequences or harm comes to me personally, I can do anything I want.” “I am not concerned with the basic rightness or wrongness of it.” Does your child have an internal moral compass that does not allow him or her to sin, even when no one is looking? That’s what “getting to the heart” is all about. We can think that we are doing well because our kids fear punishment, but training is not about fearing punishment, it is about loving what is right. How can you train your child to look at the moral reasons before she looks at the practical reasons when making decisions? How can we show them that pleasing God is more important than feeling good? 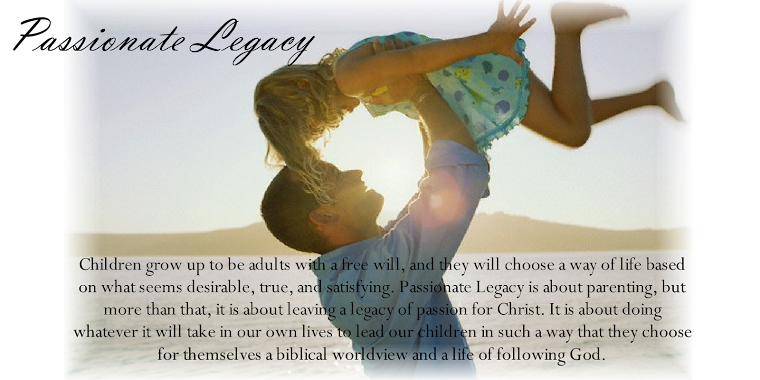 Passionate Legacy Principle #3: Aim for the heart. The goal of parenting is to instill a desire and ability to love God and obey Him. Our primary job is to motivate our children to obey God out of a love for God and a love for what is right. Our secondary job is to equip them with the tools to be able to accomplish this with success. We must be careful not to train children only in the “avoidance of punishment.” That’s not reaching the heart. We want them to be motivated by love for God. A child who loves to do right will love God, and a child who loves God will love to do right. The primary consideration in early parenting is the child’s heart and not simply outward behavior. The heart is the center of who we are and the director of our behavior. Psalm 139:23 tells us that the heart is the part of us that God looks at and searches. Jeremiah 17:9 says that the heart is deceitful above all things and beyond all cure. Proverbs 22:15 says that a child’s heart is filled with foolishness. If we as parents are going to reach our children for Christ, we will have to find a way to reach their hearts. Introduce children to a love relationship with God. Our love for God is motivated out of gratefulness for His sacrifice for us. Obedience to God’s commands (which includes loving others and obedience to authority) is motivated by love for God. So, our children first need to experience God’s forgiveness and restoration, then they will have an internal heart motivation to please Him, out of love and gratitude. Be passionate in your own love for God and His ways, and be consistent in your obedience to His ways. Example motivates the heart. Be an example of good authority rather than corrupt authority. By only giving children commands with pure motivations and good reasons, we teach our children that God has good reasons for His commands and that He is trustworthy. It is hard to follow rules when the people who made them seem to be untrustworthy, arbitrary, inconsistent or incompetent. It is even harder if they are rude or even mean. By treating children with respect as we lead, we teach children that God is loving and good. We need to be an authority that is easy to follow, because we want our children to find it easy to follow God. We want to make our children’s first experience with God’s holy law a good one. We want them to be internally motivated to see authority as good and right. Explain the reasons for rules. Help children understand that rules are not just arbitrary, but that they are there because of safety, love for others, or purity. They are there for the good of all people. There is a difference between knowing what is right and knowing why it’s right. Young children who know what is right may only be motivated to do what is right when they know there will be a consequence, but as they get older, children will need to understand why it is right in order to be internally motivated to do the right thing regardless of who is watching. Knowing why it is right motivates the heart. When children disobey, help them to see the problem in their heart and help them to mend relationships with God and others. Be willing to spend time with them as they explore their motivations, wrong actions, guilty feelings, and desire to make it right. Be on their side as they fight against their sinful natures. As we discipline, we need to make sure we are not doing so in anger. Discipline is for the purpose of developing the self-control children need to bring their behavior in line with God’s holy standards. It is not for the purpose of making our lives easier or because their behavior makes us angry. Anger causes the tension to be between ourselves and the child, but the tension needs to be between the child and his wrong action which was born out of a foolish heart. Discipline should cause the child to be internally motivated to follow God’s law in the future, if the discipline is not causing this then the methods need to be reexamined. Give lots of instruction in how to live according to biblical standards. In Proverbs 4:20-27, Solomon instructs his son to guard his heart, to keep perverse and corrupt talk away from his lips, and to stay on the path of obedience to God. Holy living does not come naturally, it has to be taught. Our culture is doing a great job teaching us how to live according to our sinful nature. Training our children how to live according to God’s standards is a sacrifice of our time, but it must be our highest priority. Our children’s hearts must be instructed, before they can live out the heart-knowledge of God’s moral principles. This week, we address another question that was sent to us by a reader. A: No, you are not being unrealistic. She is old enough to be trained to have good table manners. In fact, if she is not trained now in positive mealtime behaviors you will only have to work harder later to help her unlearn bad habits. For younger babies, I would recommend teaching her sign language for “all done” and “more please”. But since she is 21 months I will guess that she is verbal. You will have to devote your full attention to all of baby’s mealtimes for a time, while you go through the training process. You can’t leave the room even for a second. To train a child to not drop food, give immediate attention to the first offense. First, correct the child verbally. In a calm voice say, “We don’t put our food on the floor.” Next, provide an attention getting squeeze to that hand while pointing out what that little hand just did. Finally, if your instructions are ignored, isolate her in the crib for 2-5 minutes. She will understand the difference between isolation and nap time. When the isolation period is finished, bring her back to the high chair and try again. Don’t show any frustration or exasperation, this is simply a teaching process, you are the teacher and the “dining room” is simply a classroom for student learning. If the child persists in the behavior, repeat the isolation consequence 2 to 3 times, and if it continues, mealtime is over. If you follow this process immediately and consistently you will speed up the learning process. There is no need to show anger or lose your temper during this process, keeping your cool is important. I try to remember that being in control of the situation and being in control of the child, depends on being in control of myself. You may be concerned that she will starve. She will not. She has a very small tummy and needs a lot less calories than we do. She will eat when she gets hungry. And if she has a hearty appetite when she gets into her seat the next time, she will be more motivated to eat rather than play with her food. Don't let her eat while she is out of the high chair and don't let her walk around with milk or juice in a sippy cup between meals. This will fill her up with the wrong balance of calories and cause her to be too full to eat the balanced diet that she needs, and will sabotage the whole teaching process. All other high chair violations, such as flipping the plate, playing with food, messy hands in hair, banging on the tray, standing in the high chair, spitting “raspberries”, screaming, etc. are handled in a similar way. Start with a verbal warning “No, don't touch your plate”, “No, keep your food in your mouth,” then continue with the steps explained above. The key to success in this area, as in all areas of teaching and consequences, is being prompt, consistent and sacrificing what you would like to do - sit and enjoy your meal in peace - to engage in this teaching process. This takes time, effort and energy in the younger years, but it is an investment that will pay off over the long haul. Thank you to everyone who has sent a question in to Passionate Legacy! Keep them coming and we will do our best to get to each of them. Do you hear the constant, persistent nature of this training? You cannot expect to just read a couple verses to your children one day and expect them to be good to go. We find ourselves regularly cover Scriptures with our children, and we print and post them up in prominent places in the house (like the doorframe of the dining room). I would encourage you to print the verses and principles below, and read just a little bit each night with your kids and talk about them together. Bullying is the intimidation of a weaker person: the process of intimidating or mistreating somebody weaker or in a more vulnerable situation. Sometimes kids think it’s funny to cut someone down to make others feel bad. And they actually feel proud of themselves for making such a good comment that hurt someone else! Why does that make people feel proud? Satan is playing on a desire to feel powerful. Isn’t it twisted to feel good when we hurt another person? We should feel good when we are kind, not hurtful. When someone does a good “cut down”, who is rejoicing, God or Satan? Satan tempts us with pride. Pride is when we feel like we are better than others, and that’s exactly how Satan wants us to feel. It causes us to treat people like they have no value at all. He wants us to idolize ourselves rather than God. He wants us to substitute the powerful feelings that we get when we hurt others, for the good feelings that we get when we know the value that we have in God’s eyes, that we are God’s child, that we are very special and important to him, and that we are loved by him. Don’t let pride sneak into your life. Don’t allow Satan to be your master and let selfishness control you. But see yourself the way God sees you, and see others the way God sees them. Every person is made in the image of God, and you must not tear or rip away the image of God in another person, even if it is “just” mom, dad, sister or brother. Don’t let selfishness sneak in either. Selfishness means each person looks out for his own self. If everyone is selfish, no one will be treated right, but if everyone chooses to be loving, everyone would receive love. We need to choose to be selfless and love others by putting their needs first. Even if someone does something wrong to you, you are responsible to do what is right. And the right thing to do is to always respond with love, not anger, and forgive, not hold a grudge. The Bible says to treat others better than yourself, even if you have been hurt. You need to chose to obey God’s word even when it’s hard, because it is right. And the result will be, that more people will want to be around you because you are a good friend. Principle #1 Loving God means loving others. If anyone says, “I love God,” yet hates his brother or sister, he is a liar. For anyone who does not love his brother whom he has seen, cannot love God, whom he has not seen. And he has given us this command: Whoever loves God must also love his brother and sister (1 John 4:20-21). Principle #2 Loving others means laying down our lives. This is how we know what love is: Jesus Christ laid down his life for us. And we ought to lay down our lives for our brothers and sisters (1John 3:16). Principle #3 Loving others means putting their needs first. Do nothing out of selfish ambition or vain conceit, but in humility consider others better than yourselves. Each of you should look not only to your own interests, but also to the interests of others (Philippians 2:3-4). Principle #4 Loving God and loving others means making every effort to not fight or disagree! Make every effort to live in peace with all men and to be holy; without holiness no one will see the Lord (Hebrews 12:14). Principle #5 Fighting is caused by selfish desires. What causes fights and quarrels among you? Don’t they come from your desires that battle within you? You want something but don’t get it. You kill and covet, but you cannot have what you want. You quarrel and fight. You do not have, because you do not ask God (James 4:1-2). 1. I will remember that everyone has the same needs, wants and desires as I do. 2. I will remember that making my desires more important than others is selfish. 3. I will give up my selfish desires so that I can get along with others. 4. I will be happy with what I get, rather than fighting or sulking. 5. I will make every effort not let my selfish desires cause me to fight or disagree with people. 6. I will not allow my needs, wants and desires to become so important to me that I am willing to fight with others. 7. I will enjoy how everyone gets along, when no one is selfish.